Emerging technologies like virtual reality , 3D Printing and Internet of Things are rapidly reshaping the world.For consumers, virtual reality is already a fact of life in many amusement parks, online games, and even movie theaters. Do you think about applying VR technology in business world? 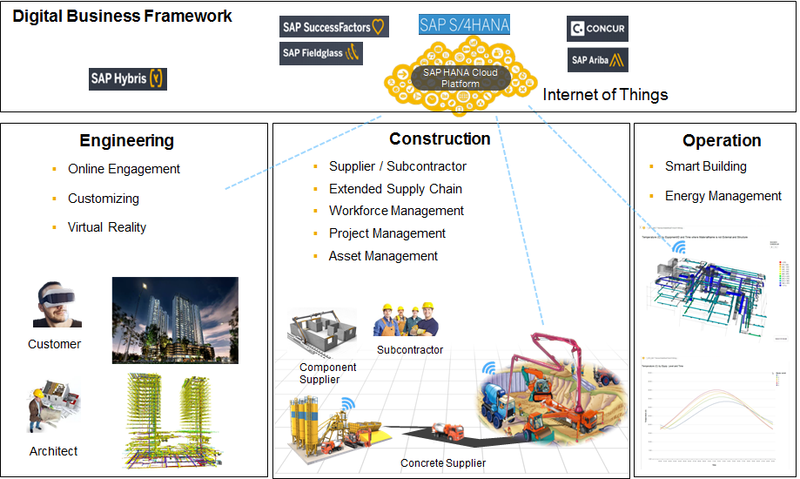 This visionary prototype will show you how SAP leverage these emerging technologies to change the way of your life and work in Engineering, Construction and Operation Industry. Consumer can customize their future house online. He/she can select different architecture style, room layout, building materials, color etc. and experience the 3D house model immediately via VR glass. Leverage IoT technologies, constructor can track building component in transit status, predict transportation delay and analyze the impact to project schedule. Constructor can predict delay task on critical path and optimize schedule with real-time simulation that can significantly improve operational efficiency and profitability. This blog outlines our general product direction and should not be relied on in making a purchase decision. This blog is not subject to your license agreement or any other agreement with SAP. SAP has no obligation to pursue any course of business outlined in this blog or to develop or Release any functionality mentioned in this blog. This blog and SAP’s strategy and possible future developments are subject to change and may be changed by SAP at any time for any reason without notice. This document is provided without a warranty of any kind, either express or implied, including but not limited to, the implied warranties of merchantability, fitness for a particular purpose, or non-infringement. SAP assumes no responsibility for errors or omissions in this document, except if such damages were caused by SAP intentionally or grossly negligent.In the current global economic environment, identifying and managing credit risk across an organization has become increasingly important to the success and longevity of any business. SAP HANA accelerates processes and breaks data volume barriers to provide new management insights; financial operations teams want to better balance credit risk and opportunity – using all internal and external information they have available to them today. Can we bring the power of HANA to bear for more insightful credit management?